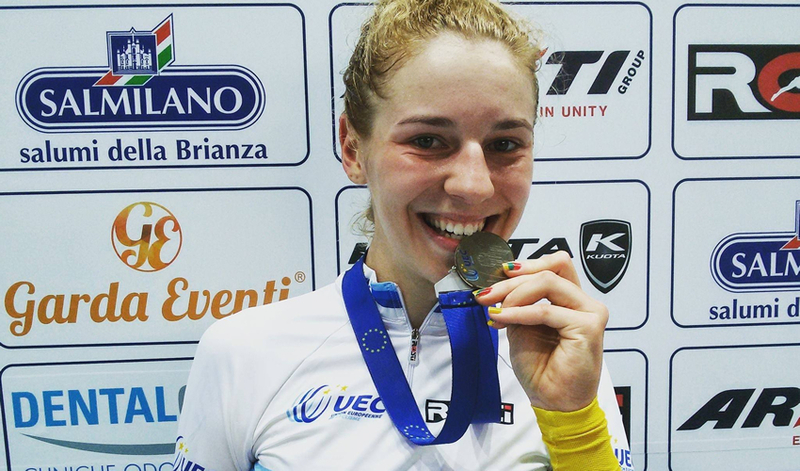 18-year-old Olivija Baleisyte announced her status as a rising star on the track after breaking the under 19 individual pursuit world record at the Under 19 European Track Championships in 2016. Baleisyte's time of two minutes and 22.311 seconds eclipsed the existing mark of 2mins 22.499secs set by six-time junior and elite world champion Amy Cure in 2010. After making her elite debut at the European Championships last October in the individual pursuit Baleisyte has since been working on gaining experience in the new omnium format. Finishing top 10 at 6 Daagse Gent, Track Cycling Challenge Grenchen and Prova Internacional de Anadia before finishing 13th at the Cali World Cup. In her elite World Championship debut Baleisyte is focused on development as she looks to gain more experience in the omnium. I first started from triathlon when I was seven years old. Then everyone noticed that I am uncatchable on my bike. So then I tried cycling like the first sport and I loved it, then I was 10 years old. Broke the individual pursuit World Record in qualifying at the Under 19 European Championships what went through your mind when you looked up and saw the time? It was hard to believe it... When I finished I knew that the time was good, because I even caught the girl from the other side of the track. But when I saw my time I was shocked. I couldn't even wave my hand or show how happy I was because I was in shock at what just happened. Ahead of the European Championships was the World Record something you were thinking about? Really no. I was dreaming about the champion's jersey but I thought it would only be enough to ride 2:24. Only one day before the start my teammate and I were talking how Amy Cure was strong and we were thinking who could beat her 2km record. If anyone had said that tomorrow I would beat it I think that at that moment I would have been laughing a lot. After winning bronze in 2015 what did it mean to come back and take gold in 2016? In 2015 bronze for me was like a gold. But in 2016 I knew that this year and this discipline was mine and I would take gold home. It was a quick turn around from European Championships to the World Championships how did you find it? It wasn't very good for me. I wasn't able to get sauna or massage and to have some rest, there was no time to have some rest and prepare for Worlds. Just after the Europeans we needed to hurry. I think it was quiet good advantage for riders not from European countries. Sixth fastest in qualifying at Junior Worlds after setting the World Record only a week earlier it must have been disappointing not to ride off for a medal? For me it was heart breaking. After beating world record I almost felt the world champions jersey in my hand... I was dreaming about taking gold in this discipline but this is how it goes sometimes... My legs were like jelly. I don't know what happened that day. You then lined up in the omnium after the disappointment from the IP was it hard to refocus? In the evening I was having recovery ride on the rollers and watching finals. It was hard to see the Russian girl just win the gold, when I was beating her three times at the European Championships. But after that moment I just forgot everything and next day my head was clear, as ever. Now my goal was to medal in the omnium. Had a strong showing in the omnium including winning the IP to finish sixth were you happy with how you raced? In the first event, 10 meters before the finish line I fell down when I was riding for the third place but after falling I finished sixth. The IP was with a lot of pain. Winning the IP I was as happy as setting new word record. It meant for me a lot because I once again beat my strongest competitor Russian girl Masha [Maria Novolodskaya], only now after yesterday she was the World Champion. It was hard to understand why sometimes everything goes against you. Why I couldn't set that time yesterday in IP and why I could that day. But it was good to know that I can be fitting for the medal now in omnium. After the first day I was in third place. The second day it was very hard to ride because of my injuries. I think it made my race even harder. In all I wasn't happy with sixth place but I was proud of how I was fighting to the end through the pain. I think 2016 Worlds were not lucky for me and I had to leave without a medal. Stepped up to the elite ranks at the European Championships finishing 17th in the individual pursuit. How did you find the step up and the increase in distance of the IP from 2km to 3km? My result shows that I didn't show the best I could to. There is a lot of room where I can improve. For now it is hard but in the future I strongly believe that it will suit me well. But at the European Championship I was very happy with fifth place in elimination race so it smooths out well. Raced the omnium at the Cali World Cup in a strong field finishing 13th after strong performances in the first three events. A hard points though race how did you find it? First three events were very good for me, after them I was in eighth place and I was going to the last event wishing to get seventh. But point race was crazy, I wasn't ready for them and I lost lap. But even 13th place as first year elite is really good for me. You have had the opportunity to race the new omnium format four times. What are your thoughts on it? Think it suits you? Taking the IP out is obviously a disadvantage for you? I think it is fair that it is held in one day. Because before second day results were all about how you recovered from the first day. And there are some stronger countries, which had better opportunity for this. So I like the new omnium. Taking out the IP is a disadvantage for me but taking of flying lap was quite good for me, because it was my worst event. What does it mean to be selected for the World Championships in Hong Kong in your first year elite? I am first year elite and opportunity to race for Lithuania in Elite Worlds means a lot. Knowing that I will start in an Olympic event with the omnium is very big responsibility. What are your goals for Track Worlds and what do you think the biggest challenge will be? My goals are to show my best and to take as much experience as possible. I think the biggest challenge will be omnium points race. I strongly believe that I will show better than in Cali.